A Coronavirus infection of chickens, with much antigenic variation. The condition has a morbidity of 10-100% and mortality of 0-1%. Infection is via the conjunctiva or upper respiratory tract. There is rapid spread by contact, fomites or aerosol. A few birds are carriers up to 49 days post infection. The virus is moderately resistant and may survive 4 weeks in premises. Poor ventilation and high density are predisposing factors. Drop in egg production (20-50%). Loss of internal egg quality. Rales may or may not be present. Yolk in peritoneal cavity (non-specific). 3-5 passages in CE, HA-, typical lesions, FA. Serology: HI, SN, Elisa, DID. Differentiate from Egg Drop Syndrome, EDS­76. Live vaccines of appropriate sero-type and attenuation, although reactions can occur depending on prior immunity, virulence, particle size (if sprayed) and general health status. Maternal immunity provides protection for 2-3 weeks. Humoral immunity appears 10-14 days post vaccination. Local immunity is the first line of defence. Cell-mediated immunity may also be important. Figure 22. 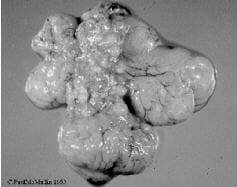 Flaccid ovarian follicles in a broiler parent chicken undergoing challenge with Infectious Bronchitis virus.